Abdul Fattah al-Sisi has urged Egyptians to work to restore stability after being declared the winner of last week's presidential election. The former army chief said he wanted "freedom" and "social justice", echoing the slogan of the 2011 revolution. Mr Sisi spoke after election officials announced that he had received 96.9% of the vote and his sole challenger, left-winger Hamdeen Sabahi, only 3.1%. The retired field marshal overthrew President Mohammed Morsi last July. He has since been locked in a battle with Mr Morsi's Muslim Brotherhood, which urged a boycott of what it called "the election of blood". Liberal and secular activists, including the 6 April youth movement which was prominent in the 2011 revolution that ousted Hosni Mubarak, also shunned the poll in protest at the curtailing of civil rights. Some journalists and government officials burst into applause and started dancing after the final results of the election were announced at a news conference in Cairo on Tuesday. Thousands of Sisi supporters also celebrated in the capital's famous Tahrir Square, cheering, singing songs and setting off fireworks. 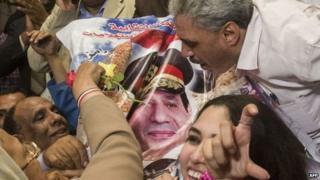 In a speech broadcast later on state television, Mr Sisi thanked voters and said he hoped to "be up to your trust". He said it was now "time to work", adding: "Our co-operation in work and construction will lead to prosperity and luxury." Saudi Arabia's King Abdullah, a close ally, declared in a letter published by the Saudi state news agency that it was a "historic day" after a "period of chaos". He also said he would organise a donor conference to help Egypt "get out of the tunnel" and "overcome its economic crisis". The Saudis, along with the UAE and Kuwait, have already promised the military-backed interim government almost $12bn (£7bn) in financial assistance since Mr Morsi was ousted. The official turnout was 47.45%, far lower than Mr Sisi had hoped for as an endorsement and only achieved after an additional third day of voting. Before the election, he declared that he wanted 40 million, or 74%, to cast their ballots to show that there was "consensus on a national level". He now faces a wide array of challenges, including fixing the economy, easing poverty and preventing further political crises. Mr Sisi has also promised to restore security in a country where attacks by Islamist militants have left hundreds of security personnel dead over the past 11 months. The militants have stepped up attacks in response to the state's crackdown on Mr Morsi's Muslim Brotherhood and its allies, in which more than 1,400 people have been killed and 16,000 detained. Mr Morsi and other senior leaders of the Brotherhood, which has been designated a terrorist organisation, are currently standing trial on a raft of charges. They strongly deny any wrongdoing. Critics fear that Mr Sisi will continue to show little tolerance for dissent. On Monday, the interior ministry announced plans to increase surveillance of the internet for a variety of "dangers", ranging from extremism to "humiliating mockery" of officials.